The new LinkedIn Contacts feature is buggy but it’s opening up incredible people sourcing possibilities. The terminology “contacts” and “connections” may be somewhat confusing. The all-new LinkedIn Contacts system allows LinkedIn members to merge the information about their contacts on several systems: 1) LinkedIn itself, 2) Gmail, 3) Yahoo mail, 4) Outlook, and several more sources. 1. You could create a Gmail account just for adding lists of people, therefore effectively merging any lists (being, for example, lists of a professional association members you’d locate on the web, or lists of people you find in Jigsaw or Zoominfo) with the member data on LinkedIn, no matter what your personal network is like. The merge is done using email addresses as the unique identifiers. 2. For people whom you add from a different account, such as Google/Gmail, LinkedIn creates a LinkedIn-alike “profile”, if it can’t merge the imported data with its own. Therefore it creates uniformity of the presentation of professional profiles for people, no matter inside or outside of LinkedIn, for you, as in this screenshot below. 3. Here’s the coolest part. You can now search across groups of people who have been merged as external lists, on their names, titles, companies, and locations. This is a capability that has been implemented in the (cool but expensive) Talent Pipeline a while ago. Here is what this search may look like. The colored “in” icons point to my connections, the grayed out “in” icons point to people with whom I am not connected. The search results will show all the matching LinkedIn profiles, even for people outside of my network, as long as there was an email address match while merging. The search is done across all of the Google-added people, but the search facets are applied to the LinkedIn data. Here is an example of how this may be used. Step 1. 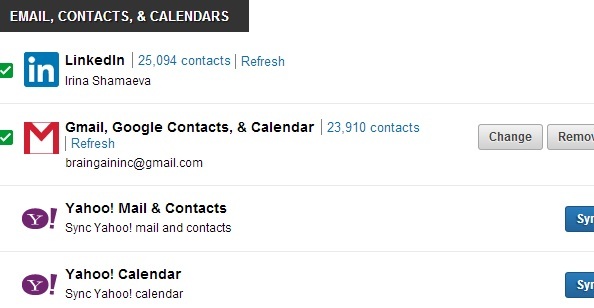 Clear out your gmail-merged contacts if you have any. Step 2. Locate a list of people (say, get a list of members of a professional association). Names and email addresses is enough information to start with. Actually, even the names are not that necessary. Step 3. Upload the list to a gmail account. Now you can search across this list of people in terms of their LinkedIn data: where they live, which companies they currently work for, and which job titles they have. To search, you would need to use “Google contacts” as the “Source”, as in the screenshot above. The search itself is quite different from before. WOW. This is incredible – and available for free, with any LinkedIn account. If you try this out, get ready to be patient. There are numerous bugs. All the numbers shown are wrong, and there’s lots more to complain about. The less powerful but also quite wonderful upload-to-invite functionality that has served us for years is mostly broken now. But this stuff is better. Wow! This is some crazy stuff you’ve uncovered, Irina!! Thanks for pointing it out and providing some direction on how it can be used. This is too cool. Thanks Irina, this is definitely a great tool – resource Tips. U Rock! I’m not enthused until I see a real use for it. All this does is give LinkedIn more data and look to you to invite non-users to establish an account. What’s in it for us? It is a mesh similar to that the one you get on a new Android phone when you connect and import the contacts from all your social networks.